In today’s post, we’ll revisit the topic of colour as an important factor in creating brand impact and helping prospective students form their initial impressions of an institution or school. Blue denotes loyalty, sincerity, and trustworthiness as well as “calmness and serenity,” perhaps explaining why it is widely used both by major corporate or even national brands such as Facebook or the United States. Conversely, the online weight loss community Three Fat Chicks argues the colour blue suppresses appetite, suggesting it should be avoided when promoting food products. Yellow conveys warning (traffic signals, warning signs, and wet floor signage), or it can suggest happiness and fun. Orange often denotes fun and creates a sense of impulse or haste. One view is that it stimulates “physical activity, competition, and confidence,” says Miss Details Design. Black adds an air of value and luxury or “elegance, sophistication, power,” according to the women’s health website Lifescript. White is often left out of colour psychology and there is debate as to whether or not it is classed as a colour – but the extensive use of white space “is a powerful design feature” – and an ever-more prominent feature of contemporary design in websites, print materials, and even products. 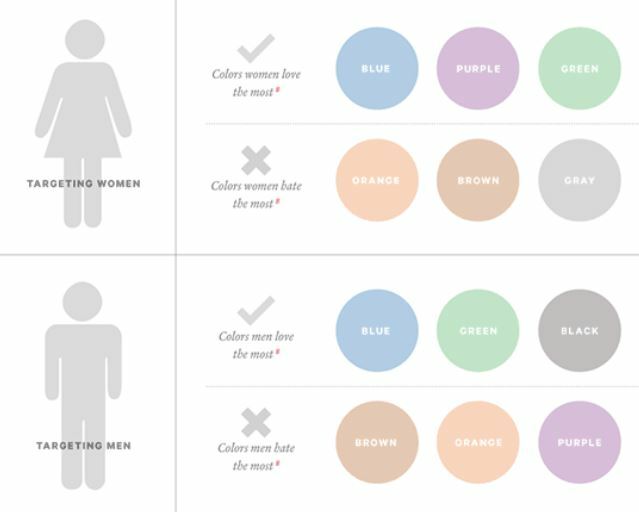 The following graphic illustrates some common gender responses to colour, including that women prefer hues such as blue, green, and purple. While men tend to prefer colours such as black, blue, and green, blue is clearly a very popular colour for both sexes. We noted above that blue is widely used by major brands, due to its broad popularity and important psychological cues. However, if you are in a crowded colour space where competing brands are using a similar colour palette, you can also adopt an alternate colour mix as a means of breaking through the competition. A recent study in the journal Color Research and Application points out that some newer brands are using the colour purple in place of the more standard blue to help them stand out from the competition. In a cross-cultural review of colour as a marketing cue the University of Wollongong’s Mubeen Aslam points out that colours can take on different meanings according to the cultural setting in which they are used. This entry was posted in Africa, Asia, Australia/Oceania, Europe, Marketing, Middle East, Most Popular, North America, Regions, South & Central America and tagged primary schools abroad, prep schools with international students, high schools abroad, international students, colleges with international students.